hmm this is starting to veer quite a long way off topic, but i couldn't not post about my latest toy (courtesy of taste-t vintage). 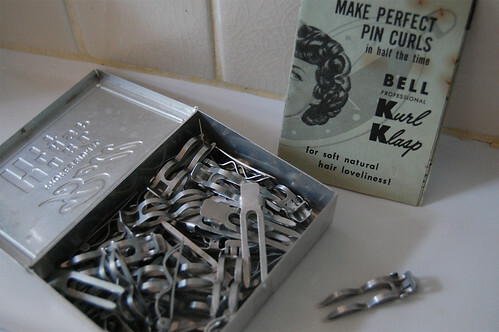 it's a bell kurl klasp kit which promises "perfect pin curls in half the time". 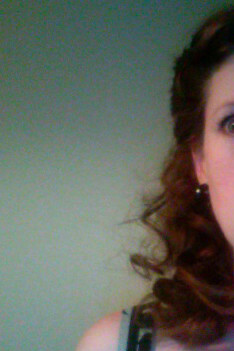 well i don't know about half the time, it took me a good hour and then some to put them in, but they're not a very long way from perfect i reckon, allowing for the fact that this is only the third time i've attempted pincurls and didn't follow any kind of pattern for the direction of the curls. i found the bell clips stay in much better than the spring loaded clips i got from superdrug and are way less fiddly than kirby grips. 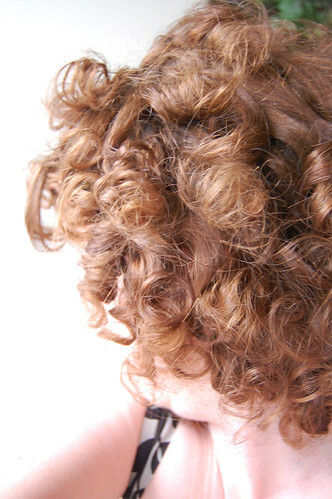 they also limit the amount of hair you can put in each curl, which helped me not to get lazy and make them too big, which was very tempting towards the end. 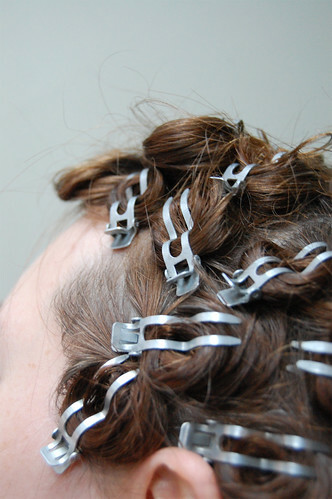 i didn't have enough to do all my hair since it's so long (i could have used larger sections if i didn't have to squeeze all that length under each clip), i used kirbies at the back. 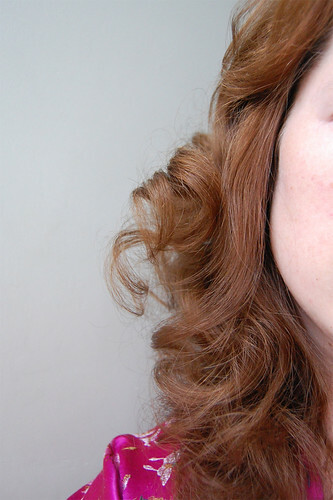 above is before brushing out, and below is the finished product after a lot of brushing. so now i can do it, i need to work out what to do with it. 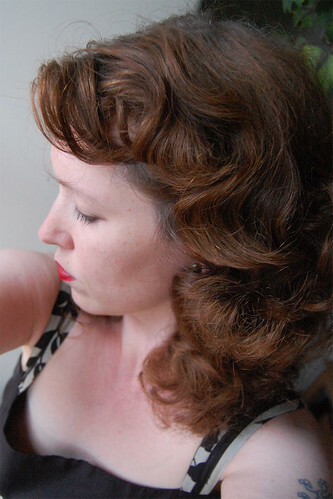 i didn’t have much luck styling the curls into waves, so i just rolled the sides back and clipped which gave a nicely fortiesish vibe without being too stylised (whilst i love some of the more “costumey” styles on other people they’re just not for me). apols for fuzzy webcam pic it’s the only one i have. also apols in general for rather odd pictures, trying to take hairdo pics that are also as anonymous as possible for internet purposes isn’t at all easy!